A screenshot is a snapshot, or picture, of your computer screen—also called a screen grab. It’s useful for demonstrating something that would be difficult to explain in words. Select the Print Screen button on your keyboard to capture an image of your entire screen and copy it to the clipboard. Or go to the Start menu and open the Snipping Tool—available in most editions of Windows Vista, Windows 7, and Windows 8. 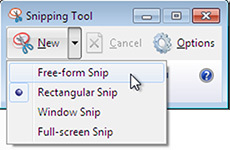 If you use the Snipping Tool, you can choose the shape of the snip, adjust the snip border, and then save the snip as a file on your computer. desktop. Or pressControl + Command + Shift + 4 to save the screenshot to your clipboard, which you can then paste into anot her program. Related Article: Know How to format a stubborn memory card, flash, hard drive.